So, Chris Finlayson and a bunch of Crown negotiators have breathed life into the Wanganui River. This chicanery – according to the Stuff report here – has turned the river into a legal entity with a legal voice. According to a spokesman for the Minister of Treaty Negotiations, it will be recognised as a person when it comes to the law – “in the same way a company is, which will give it rights and interests”. No magic was required. 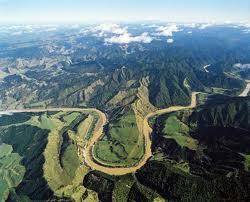 This miracle has been performed under a preliminary agreement signed between Wanganui River iwi and the Crown. The bloody press gallery hacks whose reportage appears at Stuff have done it again. They have failed to mention Alf – not even in the smallest of fonts – in their coverage of events in the House (in one case) and Rarotonga yesterday. The Manawatu Standard (here) today reports that three of the five MPs who represent the wider Manawatu in Parliament have voted in favour of gay marriage. How wide they have spread their Manawatu net is a matter of serious disappointment. Dunno why a mum named Claire Sword should be grizzling to news media about being hard done by. It seems to Alf she has been done a big favour. She has been given the opportunity to spurn hospital tucker. But the media have gone for the discrimination angle. The story (here) is about her being denied a free meal in hospital while she sat beside her infant son’s hospital bed. Other mothers were given a free feed. But Canterbury District Health Board (CDHB) rules denied her the same thing because they breast-fed their babies. How come the board’s bias against the bottle in favour of the breast? Link is shown between using dope and becoming one – does this explain the left and green vote? Alf took special interest in the news item about cannabis and intelligence. Or lack of it. The account at Stuff (here) says new research has found people who start using marijuana before the age of 18 and keep using it for years can cause lasting harm to their intelligence. But those who did not start using pot until they were adults did not show similar mental declines. News of United Future holding a conference at the weekend had Alf musing on how much it would have cost to rent a phone box for the occasion. He now concedes he was being ungenerous in harbouring that thought. United Future needed a bit more space than that. But not much more. At a squeeze, they could have held their conference in the Grumbles’ bathroom. It’s a pity Alan Bollard has done a splendid job of bringing annual inflation down to an almost negligible 1 per cent. A 5-year-old girl has become the guinea pig in her own science experiment as she tracks the progress of a silver coin through her digestive system. Niamh Aageson was playing with the coin in her mouth two weeks ago when she breathed in and accidentally swallowed the 50- or 20-cent piece. An x-ray showed the coin had gone down her oesophagus and lodged at the entrance to her stomach. Since then, the family have been tracing the coin through her stomach and into her lower intestine, using a metal detector. Leo Gao may well be on a nice little earner, while he cools his heels in the slammer (although if this be so, he is keeping quiet about it). For starters, we taxpayers will be housing and feeding him for the next few years. Meanwhile – depending on the whereabouts of a few million missing dollars and the prudence with which it has been invested – he may well be making a mint from the missing lolly. According to the NZ Herald (here), if that money – a sum of $3.8 million – were to sit in a term account at 3 per cent for Gao’s entire term of four years and seven months, it would earn an extra $540,000 by the time he is released in early 2017. You are currently browsing the Alf Grumble blog archives for August, 2012.